What kind of physician has the most meaningful job? 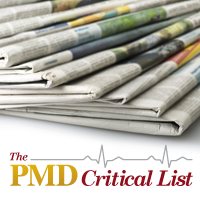 The answer is in the top story of this week’s PMD Critical List. Also making the list: How to enrich relationships with patients, doctors tend to hide medical mistakes, and advice for female physicians looking to make it to the top. “Jobs that meet the world’s needs don’t have to pay a pittance–good news for the growing number of professionals who want to take home competitive compensation for doing work that makes a positive difference.” The top seven jobs are all physicians. Number one is Surgeon, with a $306,600 median salary and a 98% high job meaning. “A program between the Brigham and Women’s Hospital and the Harvard T.H. Chan School of Public Health has made good progress changing the way patients and their doctors talk about death so that, in the end, patients’ wishes and their experience are aligned.” They identified a complex set of system failures that get in the way. “While most primary care physicians would provide some information about a medical error, only a minority would fully disclose important information about potentially harmful medical errors to patients,” finds a new BMJ Quality and Safety survey. Physicians disclosure that falls short of patient expectations and national guidelines. “Erectile dysfunction is more common in men with gum disease, according to a new review of existing studies. Scientists in China state that "chronic periodontitis treatment can control or eliminate inflammation and may reduce the risk of ED." “Women in medicine seeking to advance their careers need to be prepared to work harder, promote themselves, be in the minority and, generally, just be prepared, according to a report from the annual meeting of the Radiological Society of North America in Chicago. Here’s some leadership advice.